In this article I aim to continue analyzing small things that can be added to combat rotations and gear to take kill success and speed to the next level. Perhaps the most effective way to dramatically improve your performance at high levels of PvM is to slowly add these small little changes – for example weaving in extra auto-attacks and taking advantage of the tick system which I wrote about previously. While each of these might seem insignificant by themselves, taken together they can completely change your experience. One method, which has become more viable than ever given the recent update to rune pouches that allow players to dye them in order to use multiple pouches at once, is spell book swap. The spell book swap spell, available while on the ancient magic book allows players to switch to either the lunar book or normal book for two minutes of time or one spell use, whichever happens first. This gives players a tremendous amount of flexibility in combat in exchange for a bit of extra effort. This method also became far easier this year when the ability was updated to allow players to swap books by right clicking on the ability when on a bar and much more fluidity switch. Prior to this update a dialogue box came up that could be interrupted by combat, which made things feel clunky. This lets players use ancient magic spells – blood spells (passive heal), ice spells (freezing), and intercept for group content (functionally required in some places such as bomb tanking Hardmode Vorago) and swap spell books to normals in order to cast vulnerability (the spell that gives a massive +10% damage for one minute), or lunars for disruption shield (completely blocks the next hit taken) – a huge help in many places. In order to give yourself the full range of options to case ice/blood spells, vulnerability, disruption shield, and spell book swap players need to bring 10 runes: fire, water, earth, air (can swap steam and dust for a big increase in cost), cosmic, body, astral, soul, chaos, and blood. With only the single large rune pouch, the 7 inventory slots required was very significant, although this is so advantageous that I would always bring them anyways, but can now be taken care of with only 3 slots – 3 large pouches in the inventory. The additional 4 slots let players bring extra food, weapon switches, or combat dummies. Additionally, the rune pouch update solved the annoying issue of constantly having to swap out runes/change presets, which led to many instances of people forgetting something vital. Furthermore, players will often bring vengeance and heal other as well, which becomes much more convenient with the pouches. While high level PvMers have universally loved this update, RS PvM twitter exploded with statuses declaring it the best PvM update of the year after Solak, not everyone felt this was a good change. People flamed mods on Reddit for continuing to buff magic or arguing this is overpowered. The flip-flop that occurred over whether to nerf the update caused even more anger, with players feeling like the mods were giving too much deference to the PvM community when the same isn’t true for skillers. While I won’t get into this second contention here, I think this update is on-balance a good one. The primary function of this update is less its utility as an inventory slot saver and more a huge quality of life convenience update. While this might surprise many readers given the perception of difficulty afforded to high level PvM in RuneScape, there are very few places where I use much food. 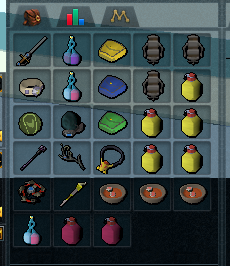 For example, I only even bring 2 brews and 1 soup to fight Solak and I generally utilize less than 1 brew when bomb tanking Hardmode Vorago. The real advantage is for those players who are less confident in their ability to minimize food usage and were afraid to test out spell book swap. Perhaps with the new update, many of those players who were on that edge can now safely take advantage of spell book swap and push themselves to another level, which in my mind can only be a good thing. As far as it being a magic specific buff, this is somewhat true, but it has been standard for a while to use disruption shield with range and melee, and is becoming more common to bring a wand/magic defender swap with those styles in order to case vulnerability where applicable. At Vorago/HM Vorago specifically, it’s a huge benefit to the base who typically uses melee, as there are many cases where they use intercept too. A second, much easier, way to improve success in PvM is taking advantage of combat dummies. For years, PvMers would spend hundreds of mills on Treasure Hunter during combat dummy promotions in order to stack up on melee combat dummies – the only type that can be attacked by all three styles – in order to build adrenaline before and during fights. With the release of invention, at the cost of 15 deflector parts and 2 strong components – I would recommend chucking a few thousand Hard Leather Shields or Green D’Hide Shields in your dissembler machines – players can create the Combat Dummy MKII. These dummies are tremendously useful for many bosses. Being able to build on a dummy at the max guild or outside the encounter to start a boss fight such as Telos, Nex, Solak, or Nex: Angel of Death with 100% adrenaline can be hugely beneficial to kill speed and consistency. For Araxxor top path kills, starting with 100 adrenaline can really help players who are either newer to the fight or for doing speed kills. During kills is where the dummies truly shine though. For Araxxor, most players find starting phase 4 with an ultimate ability to be by far the easiest way to take down Araxxi, but maintaining full adrenaline at the end of phase 3 can really impact kill speed. Dropping a dummy down during the phase animation will allow you to build up to 100 so you’re never worried about adrenaline. If you have mutated barge, you can charge the damage over time effect letting you get in a damage over time assault which is very nice. At Vorago, especially for hard mode, the phase transition gives players ample time to drop a dummy and have the team build back to 100, massively increasing kill speed and consistency since players can begin every single phase with a Sunshine/Berserk/Deaths Swiftness or an onslaught. Additionally, it’s become common practice to drop a dummy at the start of the phase so players can pre-Sunshine during the animation, which lets you begin the phase with a wild magic inside of your Sun, which is hugely beneficial. During the phase 10/11 animation, utilizing shield dome breaks the animation, letting players drop a dummy and start phase 11 with 100% (or close to it) adrenaline, which is a hard counter to the phase 11 mechanic of draining adrenaline to 0 at the start. (This is arguably bug exploitation, but has become so common to the point of being standard practice). The use of dummies has become so ubiquitous among high level PvMers that rotations are built with their use assumed. For me, the best part about the rune pouch update hasn’t really been that players can bring extra food, but that they can bring extra dummies. It might seem like extra effort, but if you begin to utilize one or both of these small additions when you PvM, I am confident you’ll notice results very quickly.